87% percent of the world’s population lives in a country without a free press. Erdogan’s crackdown of the free press has grave implications for the rest of Europe. But Turkish journalists are fighting back — here’s how the media is using technology to reinvent itself in order to survive in one of the world's most press-hostile states. “I wasn’t at home the day the police came for me. My friend told me it had happened, so I didn’t go back. Instead, I went underground. But after five months of this hell, I decided to escape.” Arzu Yıldırım is speaking via Skype from Canada, where she has sought refuge. If she returns to her native Turkey, she faces imprisonment. Instead, she joins the growing ranks of the Turkish journalists-in-exile who are being persecuted for simply doing their job. The Turkish media is facing the wrath of a government that is using a coup attempt to root out the opposition. Under the cover of an ongoing state of emergency, journalists are being hounded and locked up, media outlets are being closed and the free press is gradually being bought by government-affiliated businesses. Yet, out of this despair comes a glimmer of hope, a silent revolution of new media, finding ways around the repression to get the message out. And it’s not just in Turkey. Eighty-seven percent of the world’s population lives in a country without a free press. As media censorship spreads across Europe, resilient journalists are bypassing the mainstream to raise their voices from brand-new platforms. Turkey has quickly become one of the world’s worst countries for press freedom. A report by the Office of the United Nations High Commissioner for Human Rights released in March details 300 journalists arrested in 2017, and 100,000 websites blocked. Around 200 media outlets are known to have been shut down, and the International Press Institute’s #FreeTurkeyJournalists platform lists 154 journalists currently in prison. Turkey has long suffered from state interference in the media, but matters have taken a steep downward spiral since the attempted coup of 2016, when a faction within the Turkish armed forces tried to wrest power from government institutions. This worrying trend continues in 2018, as a crisis in the judiciary weakens the media still; in January, two high-profile journalists remained in prison even after Turkey’s constitutional court ordered their release. Between January 20 and February 26, 648 people were detained because of their posts on social media. Under mounting international pressure, German-Turkish journalist Deniz Yücel was finally released. But he had been held in pre-trial detention for 367 days, without any charges. In another crushing blow, 13 journalists who worked for an opposition newspaper were sentenced to prison on April 26 for “aiding and abetting terror organisations without being a member". Another worrying trend is the state seizures of media outlets, which are subsequently bought by pro-government businesses, creating what has been termed a ‘pool media’ – newspapers all churning out exactly the same pro-government stories. In what some see as a death blow to Turkish independent media, in March, the Doğan media group, owners of the last credible opposition newspaper and television channels, was bought by a business conglomerate with government ties. In reaction to this trend, one young Istanbullite told me that she now avoids the news, as she considers it all to be government propaganda; trust in the mainstream media is at an all-time low. But despite these hostile conditions — or perhaps because of them — there are still many good journalists in Turkey, working hard to get the story out. Unable or unwilling to use traditional media, they have been at the forefront of a wave of innovation. Led by a number of determined journalists, the free Turkish media is evolving, a silent revolution taking place out of the reach of the government’s autocratic measures. "'Media in exile' is one of the most powerful channels that can confront repressive governments, an oasis that offers the freedom you long for, like air or water, new proof that a true journalist never gives up…"
Writing this for the Committee to Protect Journalists’ (CPJ) blog, Can Dündar, former editor-in-chief of Cumhuriyet — then the country’s leading independent newspaper — is one of the most high-profile victims of the state’s media censorship. Shot at outside a courtroom and held for 92 days on charges related to espionage and treason — for publishing a story about Turkish National Intelligence Organisation trucks transporting arms to Syria — he has felt the sharp end of the crackdown. Now residing in Germany, he faces a 20-year prison sentence if he returns to his home country. While there is no doubt that the majority of journalists-in-exile would much rather live in their own country, being based abroad allows them to produce quality news without the overbearing weight of government pressure and the necessary self-censorship that entails. Meanwhile, 140Journos was founded in 2012 by Engin Onder, who at the time was a student in Istanbul. Feeling frustrated by the mainstream media’s inability to cover controversial stories implicating the Turkish state, he decided to do something about it. Relying upon citizen journalists and smartphone technology, 140Journos calls itself a counter-media movement, filling in the gaps that go uncovered by (the) mainstream media. The free Turkish media may be under heavy fire, but through innovative use of new technologies, a new media is rising from its ashes. Considering the heavy pressure that these journalists face, their persistence when it comes to challenging abuse of power, shining a light on injustice, and getting out the truth is truly admirable. The contract killing of journalist Ján Kuciak and his fiancée Martina Kušnírová in February of this year sent shockwaves around Europe. In their native Slovakia, thousands poured out onto the streets in protest, causing the prime minister to resign. 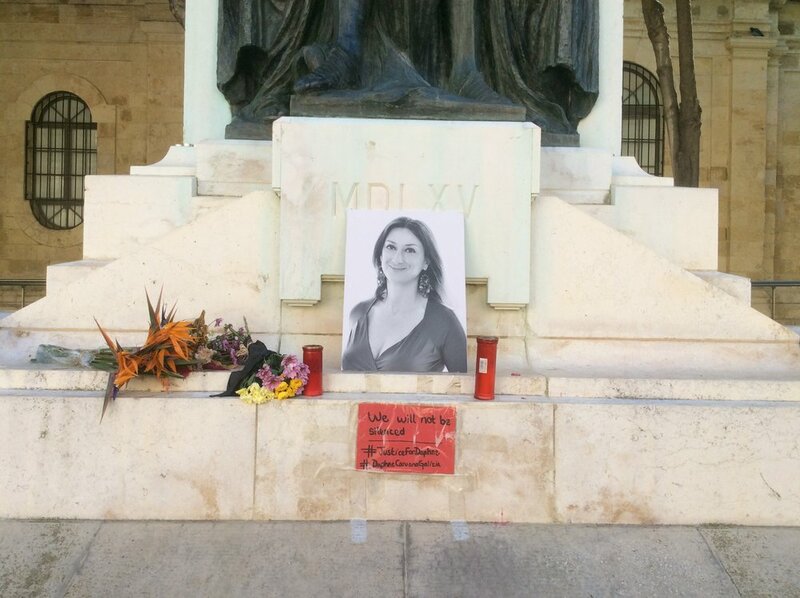 It came just months after the brutal car bomb murder of Maltese investigative reporter Daphne Caruana Galizia. The killing of journalists working to expose high-level corruption may send chills down our spines, but it is just the conspicuous tip of a huge iceberg that has the power to sink European democracy. Media oppression has swept across European borders, an insidious creep into the new normal. As the prospect of EU enlargement fades and it focuses on achieving stability over internal reforms, its influence is waning in much of eastern Europe, while Russian influence is on the rise. At the same time, fake news websites increase media noise, and as well as the usual political and financial pressures, reporters are having to deal with being labelled as spies and foreign mercenaries. But here too, the media is evolving. Ever since the Trump campaign, fake news has become a buzzword in any discussion about the media. It provides a dual threat to quality journalism. On the one hand it is a real problem, clouding the media with deliberately misleading information. At the same time, the willingness of politicians to label any unfavourable reporting as ‘fake news’ contributes to a growing mistrust in the media, which spills over to impact the work of reliable journalists too. Elsewhere in eastern Europe, there are similar problems. Belarus is rated 153rd in the Reporters Without Borders 2017 World Press Freedom Index. According to the organisation, freelance journalists working for independent media are unable to get accreditation, and often face judicial harassment. Meanwhile, both pro- and anti-Russian bloggers have been locked up. Yet, despite having to operate in these difficult circumstances, 34 Multimedia Magazine is a paragon of independent media. Aimed at the Belarusian youth, it publishes articles in Belarusian, Russian and English on subjects such as Why are gay people being detained in Azerbaijan? and White innocence: fighting racism in the Netherlands. Sometimes, it takes a crisis in confidence to bring about change. In Scotland, a whole raft of alternative media outlets set up in the wake of the 2014 Scottish independence referendum. Many pro-independence voters felt their views weren’t being represented by an overwhelmingly pro-union media. News websites like Bella Caledonia and CommonSpace, as well as the television channel Broadcasting Scotland, were established in a direct attempt to counter the perceived mainstream bias. But Can Media Ever Be Unbiased? The idea of unbiased media and objective journalism may be held up as a norm to aspire to, but few believe in it as an achievable goal. However, if we accept there will be bias, we should still be able to expect pluralism – the opportunity to hear different voices. There is nothing wrong with opinion in journalism, so long as it is labelled as such. Instead, in a world plagued by fake news, filter bubbles, misinformation, election rigging and with democracy under threat, there is a need for greater media literacy amongst the general public. We need to be able to recognise ideological leanings, hidden agendas and choose for ourselves what to believe. If not, we risk be manipulated by those who wield power. Alternative media often has its own agenda (hidden or otherwise), blurring the line between campaigning and reporting. This goes for all sides of the political spectrum. Because of course, the same digital technologies and global connectivity that have allowed free media to flourish in countries where its existence is threatened, has also enabled the spread of much more illiberal views. Xenophobic, racist, and fascist beliefs have spread across the European continent and the far-right alternative media has played a big part in this. The American flagship alt-right news site, Breitbart, was aligned with the European populist right when under the leadership of Trump’s former chief strategist, Steve Bannon. In the UK, Westmonster was founded by Arron Banks, the largest foreign investor to the Leave campaign in the EU referendum. The recent exposure of the manipulation carried out on social media by shadowy organisation Cambridge Analytica shows just how far this entangling of political aims with news media can go. The alarming events in Turkey feel a world away, but Turkey straddles two continents: Asia and Europe. By sitting back and doing nothing we are complicit in undermining the values upon which Europe was built. As ECPMF’s Nora Wehofsits wrote in an email, “I believe a crackdown like this concerns all of us. The media crackdown in a country that belongs to Europe and was aspiring to join the European Union also challenges European institutions and their credibility.” Free media campaigners and advocacy organisations across Europe believe that the EU should be doing more to assist the free media in Turkey, and that allowing Erdoğan to act with impunity paves the way for others to follow. Many young Turks have already given up on the media, indulge in digital detoxes, and no longer follow the news. But if we give up on journalism, we give up on democracy. The media is a key part of a functioning democracy, acting as a watchdog to hold those in power to account. If this supporting pillar is taken away, then the whole house of democracy crumbles. And if it crumbles in Turkey, a European country, a NATO member and a key ally of the West, then it could easily bring down its neighbours. However, there is still hope. Turkish journalists who won’t be silenced are leading a revolution against censorship, oppression and the spread of propaganda. And while, as Gil Scott-Heron wrote, the revolution will not be televised — at least not by the mainstream broadcasters — there is a burgeoning new media on the rise. Unable to use their traditional tools, the revolution that is taking place is happening quietly, beneath the surface. Help independent media - like Are We Europe - sustain itself.